Is it really possible to cook Indian food in 20 minutes knowing that the average cooking time for an Indian dish is 40 minutes?! And I say it with such conviction as it comes from a Modern Day Indian Kitchen! 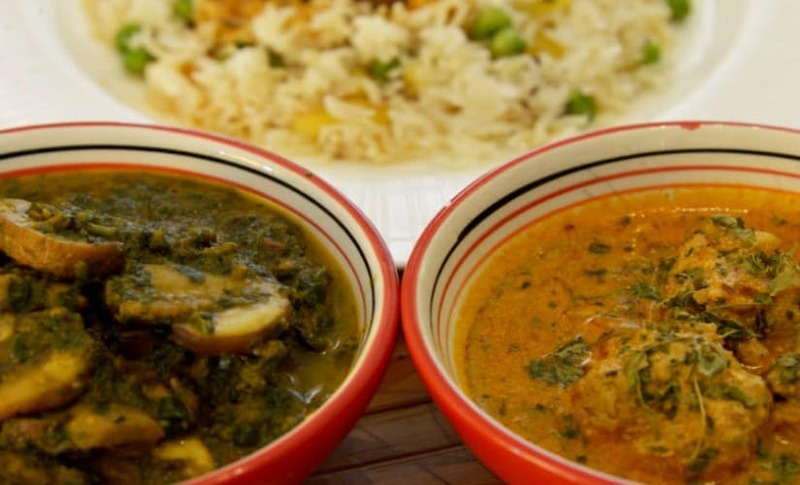 The reasons why cooking Indian Food is considered time-consuming. What time-saving tricks do I follow that helps me cook Indian food faster. Few handy kitchen gadgets that each kitchen should have. Many of us have busy lives, with work, household chores, school runs, afterschool activity and a string of daily errands to accomplish! Cooking is a necessity unless you live off takeaways or ping meals! (My name for microwave meals, although I have nothing against either). I resort to them when its too much of an ask! If you have been following my blog or on social media, you may have noticed that I call myself a ‘lazy cook’. I love to cook but hate to slog in the kitchen. I am always looking for shortcuts to cooking which my mother does not really approve of much :-), but I do not have the luxury of having a kitchen help to do the grinding tasks like most households in India. Even with using cooking shortcuts, I pride in saying that each day is a different meal in our house (if I plan on cooking every day that is). Given the fact that on weeknights I diligently stick with my 30 – 40 minutes kitchen odyssey! Let me share with you an insight into how I plan and work on my daily cooking routine which ensures that I spend no more than 40 minutes max in the kitchen each day, close the kitchen down at 7:30 pm (unless I sneak in for a cheeky chocolate/cake treat) squeeze in cuddles and giggles with my kids before bedtime and finally enjoy some ‘ME’ time ! Why Does Cooking Indian Food Take Time? One of the key deterrents for not cooking Indian food on a weekday is because many find it time-consuming, complex and strenuous with all the chopping, mincing, stirring and waiting time required to cook a good Indian meal. However, like preparing or cooking any other meals there are always shortcuts here too. All you need is to think a bit creatively. Now I do not expect everyone to put time and effort into creative culinary shortcuts, that’s where I come in to help! Indian cuisine uses many spices which can lead to confusion and make it complex. Not something you want to rake your brain for after a mind-boggling day at work, with kids or just as life happens! Cooking Indian food is not about throwing together aromates, vegetables or meat with a dash of curry powder and broth and call it an Indian curry! Sadly this is not how it works. You need to follow a certain process which can be time -consuming. The consistency of a thick rich Indian gravy comes from using onions, tomatoes, ginger and garlic pastes! Mincing or chopping each of these takes a considerable amount of time. Not something you want to cry your eyes out after a long grinding day! Almost 85 % of the dishes you search for as ‘Easy Indian Food Recipes’ will have a minimum of 10 listed ingredients, which is enough to put you off cooking. Besides, you may not even have some of the ingredients. Given above why cooking Indian food seems difficult and a task in itself, can I justify my claim to make Indian Cooking easy and complete a dish in 20 minutes? The tips that I share below will counter challenge the pain points I listed above and show what you can do to make Indian cooking easier and quicker. During my early days of kitchen ventures, I used to spend a considerable amount of time prepping, ie. chopping, grinding, slicing. Of course I still need to do the basic, but the modern day kitchen utility gadgets have taken away some of the stress and cut cooking time! Investing in a good processor is perhaps one of the best time-saving kitchen tip. A food processor for me is not a luxury but a necessity just as having a car! You have flexibility, you save -time and you can do more than one thing at a time. A food processor is not something you should buy just for making Indian cooking easy, but it can also be used for many other purposes apart from blending or juicing. You can use a food processor for making sauces, chutneys, pastes, mincing, grating and oh so important grinding spices. 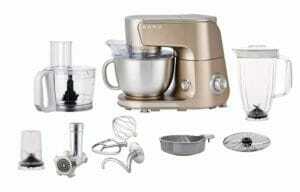 A processor with multiple attachments such as this one from BERG comes with a 4L Bowl, Splash Guard, Dough Hook, Whisk, Beater, Juicer, Blender, Food Processor, Meat Grinder and Coffee/spice Mill. This one gadget is great for making bread doughs, getting that perfectly sliced cabbage, onions, carrots or any vegetable that you find difficult and time-consuming to chop and slice. 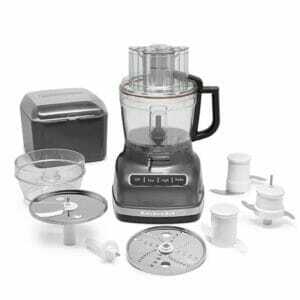 If you are outside Europe then this KitchenAid Food Processor with ExactSlice System comes as a recommended all-purpose food blender. It has the first ever externally adjustable slicing system that gives you precise slicing and accuracy for all kinds of food—hard or soft, large or small. As I make many spice blends and mixes at home, a spice grinder is where all my thinking comes to a stop. It’s great for blending spices, making spice pastes, sauces other than smoothies. 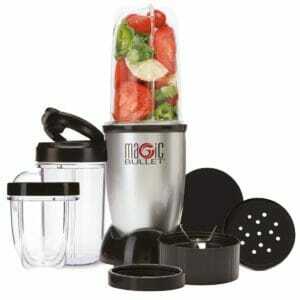 You can choose any food processor that fits your purpose and your household need. 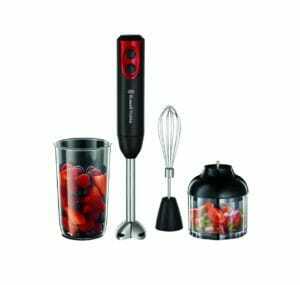 If you are not much into fancy chopping and slicing then a basic hand blender like this 3 in 1 Hand Blender by Russell Hobbs works equally well. You will find a few more suggested food processors that come recommended depending on where you live on the shopping for ingredients section. The idea behind buying a food processor or a hand blender is to make tedious tasks such as mincing, grating or chopping easy. This addresses one of the pain points of cooking Indian food, that is the tedious task of mincing, chopping and grating aromates such as ginger, garlic and onions. Trust me when I say that having one of the gadgets above will instantaneously reduce prep time by half! Spices are in the realm of Indian cuisine. It’s a given that most Indian households will have some kind of equipment for grinding spices. Having a spice grinder will help you make your own blends with your chosen spices that suit your individual and household taste. With a homemade blend, you don’t have to solely rely on the shop bought mix which has a standard set of ingredients and may not be suitable for all tastes. So for example, if your kids or partner is not into hot spices then you can choose not to grind chillies or peppers for making a curry powder at home. Or if someone does not like strong cinnamony flavours then simply cut down on them and make your own Garam Masala Powder. It gives you so much flexibility, use and ease of making quick meals without the need to measure each time. Or a more traditional mortal and pestle. The reason I ask you to have a spice grinder is that grinding fresh spices bring out so much flavour to your dishes while you can store them for upto 3 months and use it multiple times for making simple fast and easy Indian meals. Besides, it takes away the complexity of spices as you can make your own mixes with the spices you are familiar with. If the above idea of making your own spice blends is not something for you, then do buy and keep stock of some commonly used pre-blended spice blends. 3) Homemade roasted cumin-coriander spice mix. 4) Any homemade spice mix made with your chosen spices. The ease of using these pre-blended spice mixes is astonishing. All you need to do is simply add it to stir-fried vegetables or meat dish, top up with a bit of stock/ water/ coconut milk/ beaten yoghurt or tomato puree, cover so that the veges/meat get cooked properly and you have an Indian meal ready! You can also use these pre-blended spices to make Indian meals in the slow cooker as well! Making cooking an easy Indian dish even more effortless. Do you know how the Indians manage to make almost 3 meals every day!? Because they use a pressure cooker! If you do not know what a pressure cooker is, its a closed airtight vessel for quick cooking or preserving of foods by means of high-temperature steam under pressure. The Modern day pressure cookers are absolutely safe to use without the fear of a bursting chicken in your kitchen! This Pressure Cooker from Tower is very reasonably priced for those new to using it and user friendly too! You do need to get used to it and get familiar with its setting before making meals in it. When in rush and fancy a rice, lentil or meat dish which can take upto 30 minutes to cook if cooked on a stove top then a pressure cooker comes handy! All you need to do in saute the aromates, add your chosen spice mix, add your chosen protein, veg or legume, top with some sort of liquid preferably water, broth or tomato puree, cover and bring to full pressure. Once it reaches full pressure reduce heat or remove from heat depending on the time it takes to cook the raw ingredients used. Here are few tips on using a pressure cooker. This is perhaps one of the best cooking tips for cooking an Indian meal at home I share with everyone! When you fancy Indian flavours but do not fancy the tedious task of standing over the kitchen counter following each of the Indian cooking processes, then simply skip using onions in the dish! I say this because most Indian dishes require onions to be cooked till brown which can take anything between 7 – 10 minutes. By skipping this process you can instantly save 10 minutes of cooking time. If you must, then replace onions with either the lesser own Indian spice called Asafoedita, leeks or use pre-fried onions that you get for burgers. I am happy with using garlic or ginger which takes just about a minute in hot oil to cook and bring out the flavour. So there you are, with my handy Indian Kitchen Tips and cooking ideas that will save you about 20 minutes cooking time without compromising on taste or health! Get a good food processor or hand blender to help you with chopping, mincing, slicing and grinding. This will save time chopping as well as make quick sauce base for easy sauteing. Having a spice grinder gives you the flexibility to make your own homemade blends and keep pre-blended spices ready to use next time without the need to measure and mix. If grinding spices is not your thing then buy readily prepared spice mixes and use them for making quick Indian meals. You will not need to buy different spices and yet have easy meals to cook. Use a pressure cooker for cooking hard, time-consuming ingredients such as meats, lentils, legumes. They help retain flavour while reduce cooking time by half. Using onions to make an Indian curry is optional (although not for traditional Indian recipes). You can replace it with leeks, pre-fried onions or asafoetida for added taste. Easy Indian recipes To try Using the Steps Above. I will be soon shooting out a series of recipes and videos sharing some of the Indian dishes I make at home using the tips above. So do sign up here to keep yourself posted and also get a free handy ebook of cool Time- Saving Kitchen Tips. As a filler here are few recipes that are tried and tested in my kitchen and are truly easy to make with minimum ingredients for you to try. What other kitchen shortcuts help you save time? I am a sucker for them so do share yours here. And as always if you think this article will help others solve their Indian cooking phobia then please share and make Indian cooking easy:-)! Hi Michael! Thanks so much for your encouraging words. It really means a lot. Glad you find the site helpful. Will try not to disappoint my readers :-)! Hi Joi! absolutely agree. Few Traditional dishes does need the care and love but when life gets busy and you still crave something special then shortcuts to help save the meal! Love the idea of making your own spice blends at home! I would love to do that every few weeks. They would still be fresher than the store, but would ad great flavor, but not to much time. I simply love having a few handy pouches and jars of spice mixes. As you said it adds so much flavour with next to no work at all! Haha.. I can totally relate to this post. There has been more than a million times I’ve wonder why Indian cooking takes forever in my kitchen! Do try the tips and let me know how much time you saved! I love asefoteida and it adds a real something to the dish. I am really thinking of getting a pressure cooker too as when I was a kid my mum used ours all the time! I really advocate getting a pressure cooker. It sure does help reduce cooking time especially if you cook grains or meat often. This is super informative. I have been looking for a really tasty dish to try out. Sunrita, I know exactly where you are coming from. I am from Haiti, and sometimes it feels like it takes HOURS or DAYS to cook one “quick meal”. I do not have a spice grinder, which now I may look into, but I do have a mortal and pestle. The pressure cooker is also a must in my kitchen. It saves me at least 2 hours depending on what I’m making. Very helpful tips. Thanks Mirlene! Its really these simple things that make our life easy. Please do share few dishes from Haiti. would love to make some. Awesome! You always have so much great information to share. I have to admit that I have never made Indian food before. Besides emptying a premade jar of tika masala onto some chicken and rice. You make it sound so easy. I like your idea of buying premade spice mixes, using a pressure cooker, and skipping the onions. I now look forward to cooking new meals for my family. Thanks so much! Hi Jenna! Thanks for your lovely words. Not all Indian food are easy but there sure are ways to make them easy and hence I choose the lazy yet tasty path to cooking. There is nothing wrong with using a pre- made sauce, but the real taste gets a bit hidden. Try a spice miz instead, they have less preservatives and taste better. This sounds super yummy. I should give this a try! Thank you so much for these wonderful tips! I have been making a few Indian recipes over the last year and would love to try more! I’m embracing all the wonderful spices! Hi Jen! So glad that you are enjoying the Indian food experience. Do check the recipes on this site which are all child friendly and yet with an option to increase the heat!